Located on the South End of the Island, this beautifully decorated 3 bedroom condo. Approximately 75 yards walk from the beach, has an open floor plan with a spacious kitchen and living/den area. Features include : corian counters, stainless steel appliances, seating for 6 dining area, TV, DVD and WIFI. The master bedroom is furnished with a king bed, flat screen television and en suite bathroom. One guest has a queen bed and the other has 2 twin beds. 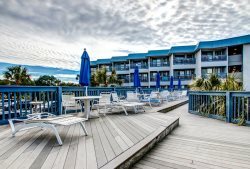 Just walking distance to the pier, shops and restaurants! Two covered parking spaces, Elevator. The staff was wonderful. They made the trip extremely easy for checking in and out. The property was wonderful. The family loved the location. We will definitely be using you guys next year for vacation! Property was great do wish the shower behind parking garage was in a place you could see it. Found out about it at end of stay. We had a blast. The only issue was the very foul mouthed people above us the day before we checked out. They cannot control that but I had kids and they acted like they just got off the boat. We really loved the condo and will be back. Great location. Very easy to work with. Very nice and friendly. Our second time staying in this building. The condo is very nice and clean. Easy access to the beach and to town. Overall we had a great stay, and liked the property's location. Only minor negatives were that the mattress was way softer and lumpier than we like resulting in soreness, but that is a matter of preference. And, as I mentioned, the internet was out a couple of days. Hope to visit you again.